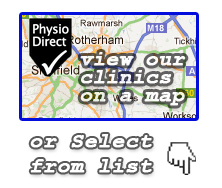 As the months go by and the nights get longer and darker, things here at PhysioDirect go into overdrive. This time of year is always busy for us with a noticeable increase in referrals from insurance companies, asking for us to help people who have suffered from whiplash injuries. It could be a coincidence it gets busier each year at this time, or because the roads are more wet with poorer visibility, or because people are distracted thinking about what christmas presents they need to buy. Whatever the reason for this increase in whiplash injuries though, the latest Remedy House course up in sheffield titled ‘Clinical Whiplash and Neck pain’ couldn’t have been timed better. This latest instalment in the Remedy House series was taken by the delightful southerner, Chris Worsfold. Chris has a wealth of knowledge and many many years of experience in the area of whiplash, and over the two days he imparted a great deal of this, cramming in loads of useful assessment tools and different approaches to treatment. To kick things off, Chris went over some of the work he’s done in the past providing expert opinion in cases that suspect false claims for whiplash. Although there may be some crooks out there that try and pretend they have an injury to get compensation, as a physiotherapist there is no doubt in my mind that this is a very real and debilitating condition. Chris made the quite remarkable point that some people on the legal side of this doubt the presence of whiplash altogether! I couldn’t help thinking at this point if these overly skeptical individuals felt this way, we should invite them to take part in some of the whiplash research being done. They would obviously be happy to sit in a car and get bumped from behind at 20 miles an hour and not have any concerns about these imaginary symptoms they won’t be getting over the next few weeks. Check for altered muscle activity in the neck – Although research shows that muscles don’t change much in composition after a whiplash accident, the way muscle work can be affected. Muscles can be sluggish to switch on, and end up weaker (which might seem counter-intuitive, as it often appears that all neck muscles are very overactive). Chris went through some nice tests here to assess neck strength endurance, control and quality of neck movement. Pay more attention to dizziness – With whiplash sufferers, a large percentage report symptoms of dizziness (a lot more than, for example, people with neck pain that wasn’t as a result of a road traffic accident). This is important. Although dizziness can be part of a cluster of symptoms that suggest something more sinister is occurring, more often than not, it’s a sign that there has been a disturbance to the sensory organs in the neck. One cause of this can be an impairment of the internal awareness of our neck and head’s position. Chris took us through a pretty cool assessment using laser beams and targets on the wall to see how well someone could get back to the a starting position when moving it with their eyes closed. Get comfortable with prolonged eye contact – Vision is an often un-assessed sense that can be affected. Disturbances in muscles that control eye movement can contribute to dizziness and headaches. If someone is struggling to focus on the TV, or when reading, or when trying to use their peripheral vision, then this might be a sign that you need to investigate further. Chris went through some more great assessment methods to pick up these problems. This did however mean spending quite a while looking into other course members eyes. The link between neck and eye movement – Our eyes and neck are designed to work seamlessly together. If you want to check for yourself, look at a spot in front of you and then try and shake your head from side to side. Notice how your eye’s stay focused on that point without any effort? This is all to do with one of the two main reflexes that help us coordinate our neck and eye movement. In a road traffic accident, these can be affected. Chris showed us some nice tests here where we fixed head position, and got them to move their bodies to one side. Testing eye control and looking for a change in dizziness from this rotated position can help identify if these reflexes are impaired. Don’t forget to look at balance – Linked to all of the above, standing balance can also be negatively affected. A quick test checking how well someone can balance with eyes open and closed, with different foot stances can highlight problems here. Now being armed with a whole array of different assessment methods, and being able to pick up issues with neck muscle control and strength, eye control, reflexes, head positional awareness and balance, knowing how to work this into our treatments was the next step. Strengthening – One of the most useful tools at our disposal is a progressive strengthening program. We looked at some interesting exercises involving weights and bands attached to the head. It might look silly but don’t let that put you off doing it. A more general approach to strengthening around the shoulder and neck can also be of great benefit. 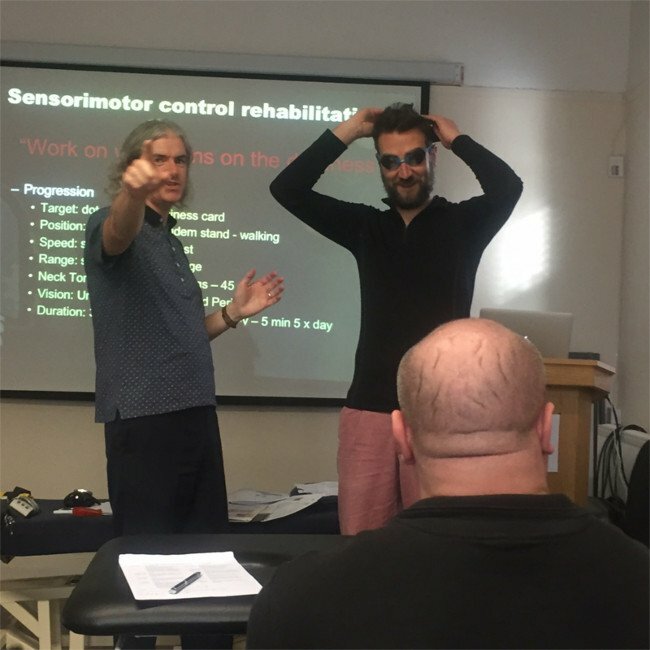 Visual and balance work, head position awareness retraining – Linking all the things we looked at in assessment, Chris took us through ways for patients to retrain visual issues, balance and neck control. We looked at ways to combine treatment of several of these issues at once, how to progress that treatment, and how to link it to someones everyday life. An example we used was a footballer having to receive and kick a ball from his left side, having to retrain his neck movement whilst tracking the ball with his eyes. This provided possibly one of the more memorable moments of the course; watching Remedy Houses’ Thomas Mitchell with a laser on his head, wearing goggles trying to balance with a narrow stance whilst twisting his neck. Taping – As an adjunct taping can be helpful in offloading some of the tension from whiplash. 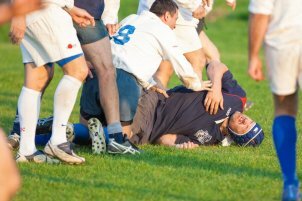 Manual therapy techniques – Some of the more traditional manual therapy techniques still have a place. Chris showed us some of the things he likes to use with his patients to help ease pain. At this point when looking at a technique digging into the deeper layers of muscle on the back of the neck, Chris was amazed by the robustness and high pain tolerance of the northerners in the room. To finish things off Chris took us through a few case studies of people he’d treated, detailing what he’d done with them and the result he’d found. Seeing how it all fit into his clinical practice was helpful to give a bit more real-life perspective on all the theory and practical stuff learned over the weekend. A course review wouldn’t be complete without mention of the catering, which consisted of outstanding hot meals provided by the local Italian, which kept everyone full and focused throughout. All in all the weekend was a resounding success, with heaps of great gems for everyone to take away and start applying the very next day.